Thank you for your business and engagement with Bruker this past year. We want to call your attention to some important changes in our email addresses for 2016. 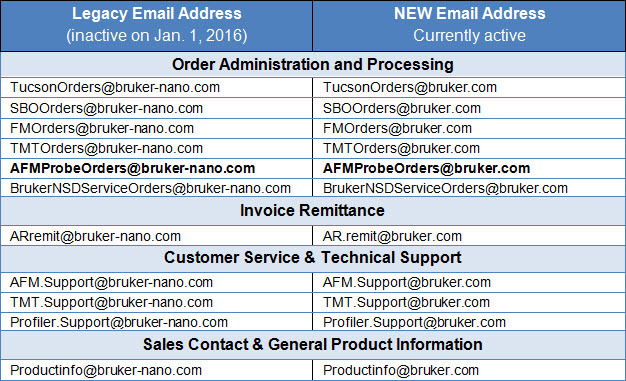 Effective January 1, 2016 Bruker email addresses with extension “@bruker-nano.com” will no longer be active. Our new email extensions “@bruker.com” are active immediately. Please make note of these changes in your files and correspondence. We will not be able to receive or respond to emails directed to the old addresses. Below is a chart to assist in identifying the new email addresses. Feel free to contact us with any questions.